Sometimes you have a week that just takes you by the throat and shakes you, and The Pug and I have had just that kind of week, albeit in very different ways. A little bit of rest and recuperation on her part, and some tea and laughter on my side, and things seem to be coming back to what passes for normal in this crazy house. …and I think I might have to join her. 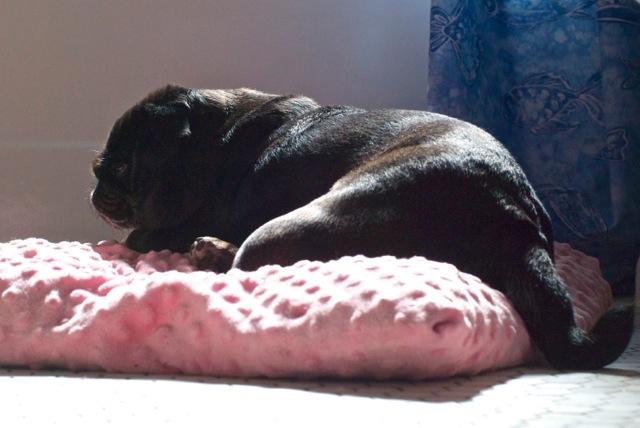 Lola Pug suggests that you all find a sunbeam today, and nestle down in it – even if it’s just for a few minutes. Happy Sunday, Happy Nap Day, and Happy Spring! We have already taken you up on that good advice, Lola P.
Like Christy and my GrandPugs, I have enjoyed the wonderful and rare sunshine today!! Thanks for the advice Ms Lola! We have finally broken the back of mean old Mr. Winter enjoy the sun Darling Lola Pug.